Matjana Preschool saw its second class of students graduate on December 5th 2008. Against the odds of ferocious weather, the day was a huge success, and immensely enjoyed by parents, visitors, and kids alike. Even the teachers, who had the “fun” of controlling 22 overexcited graduates and ensuring everything went smoothly on the day, reported having a great time. The day began early , As usual, and lots of parents arrived to help with the preparations. There was a classroom (kindly lent by Matjana Primary School) to be decorated, presents to be wrapped, costumes to be prepared and food to be cooked. Luckily there were many hands on deck and before long, the room was adorned with balloons, a Christmas tree sat in the corner with presents underneath and a wonderful smell wafted from the kitchen. There were some things that couldn’t be prepared though, most importantly the music which the kids were supposed to dance to. The teachers went to the trouble of holding the graduation at the primary school, in part so that there would be electricity and music (as well as shelter in the event of bad weather). However, due to a ferocious storm the night before, the electricity was cut (but everyone was thankful to have an indoor graduation, nonetheless). 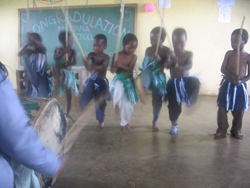 The day commenced (a tiny bit late, but that’s to be expected in Swaziland) with a Grand March- 22 five and six year olds proudly strutting into the classroom, ready to show off to their parents all they had learnt in 2008. 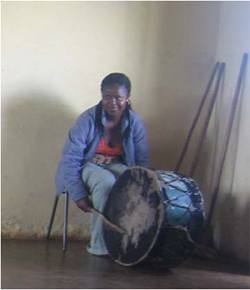 They began by singing- a combination of English and siSwati songs, accompanied by a range of actions (e.g. head and shoulders) and dance moves. The dancing began properly after that, and the boys and girls performed a number of traditional Swazi dances. The lack of music was a bit unfortunate but was compensated for in the traditional way- live style singing, from a group of quite remarkable voices trained in the local churches. Teacher Fortunate is also a pretty funky drummer, and was able to keep a beat going throughout the kid’s dances. 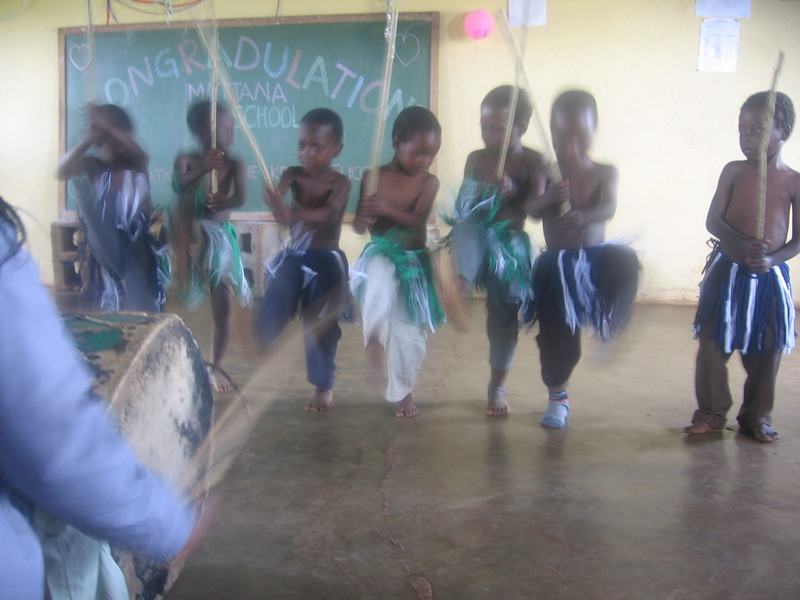 Of course the Matjana Preschool students also showed off their more academic achievements, demonstrating counting, performing short plays in English and siSwati to prove their language skills and behaving remarkably well given the great excitement of the day. After an exhausting couple of hours, the kids ditched their dancing costumes and replaced them with school uniforms and miniature graduation gowns and hats (which were placed on heads in all sorts of lopsided fashions before teachers and parents came to the rescue). 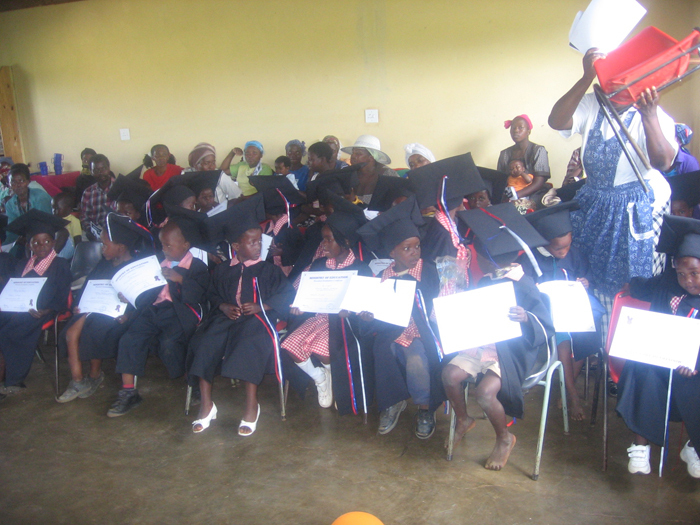 The children paraded into the room in pairs, and were presented with their preschool graduation certificate by the headmistress of Matjana Primary School, Mrs Elizabeth Nkabinde. Mrs Nkabinde also gave a speech, commenting on the importance of preschool education in setting a foundation for primary school. She complimented the parents who had taken the initiative in sending their children to preschool and encouraged more to do so in the future. She also commended Matjana Preschool’s teachers for the immense efforts that they have made to improve the school in the two years since it started. The day ended with presents, popcorn and a feast of chicken, rice and salad. The graduates have since been spotted, walking to and from neighbouring Matjana Primary School in new blue uniforms. If they are lucky, the Matjana Preschool teachers even get the odd visit from an ex-student.